With the ups and downs of cryptocurrencies like Bitcoin, Litecoin and Dogecoin now part of the zeitgeist; notable trends are starting to happen. The software is being probed more and more for weaknesses (such as the recent Mt.Gox issues), and the prices of scrypt mining hardware such as AMD GPUs are going through the roof in the US, at one point hitting $900 for an R9 290X, but quickly dropping to $700 – still well above the MSRP at launch. We have reported on motherboards from ASRock and Biostar being released specifically for coin mining, probing the market to test for volume. Many system integrators (like SCAN or OCUK in the UK) will also sell you a fully built system designed to mine coins. Naturally the next progression is chassis production. Up until this point, finding ways in which to place your GPUs can be tricky – this is especially true if you are in a limited space environment. Many enthusiasts in this area will look at multiple things – initial price of hardware, coin production, and throughput density (GPUs in a motherboard/case). At least three of the regular editors here at AnandTech are casually involved in mining to various degrees of success, including me – I am running a few systems at around a dozen cards, which can be quite noisy and generate some heat. There are others who take it to the extreme, and will run hundreds of GPUs. Building a setup for mining cards can be difficult. 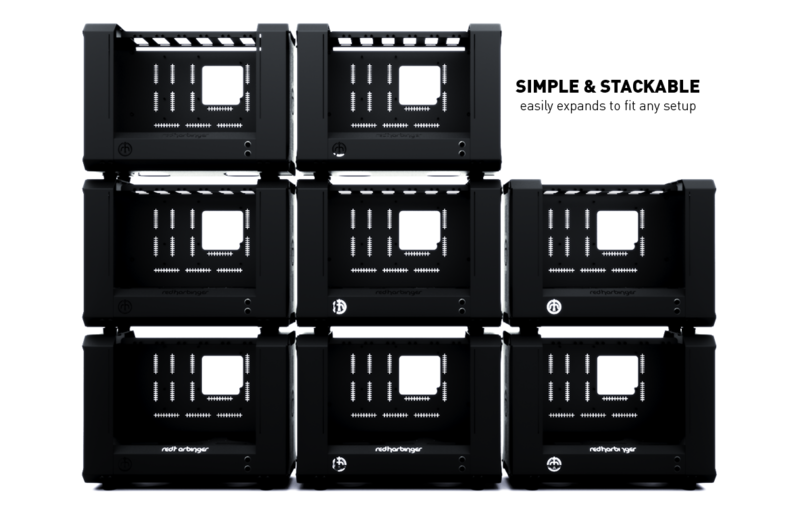 Cases cause heat to build up, but are more stackable than open-air setups. There is also an issue of noise and heat direction – finding a source for that cold air and somehow getting rid of the hot stuff. For those that monitor the mining forums, there are many fixes to this issue – some home brew, some involving Ikea, others with elaborate shelving units on wheels, and the crate method (examples of each). Red Harbinger is known in case design circles for some innovative products, such as The Cross Desk (a £1200 desk claimed to be ‘the last desk you will ever buy’), and the DopaMINE is the latest thought from the small outfit. 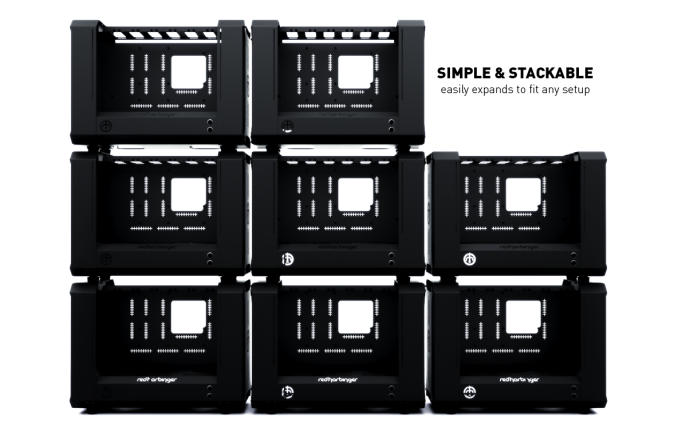 This product is to initially be crowd funded – many of the companies making mining-specific products are often wary about sale volume, so this is a good way to complete orders before production starts. 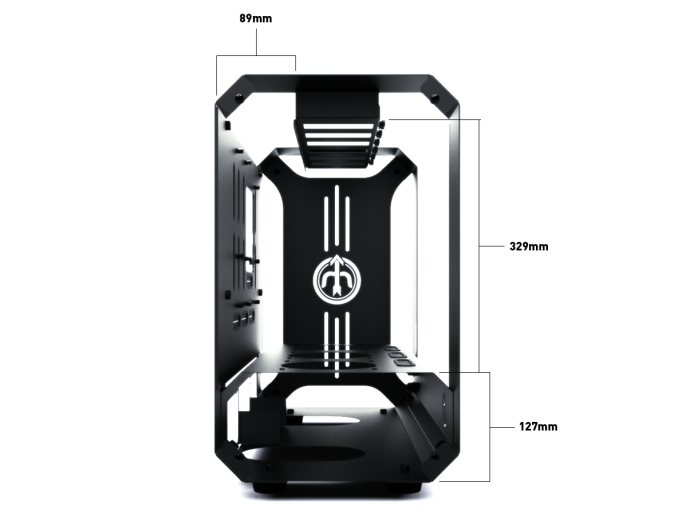 The DopaMINE is designed to be a six GPU, one motherboard + dual power supply case, capable of being stacked as well as providing sufficient airflow. 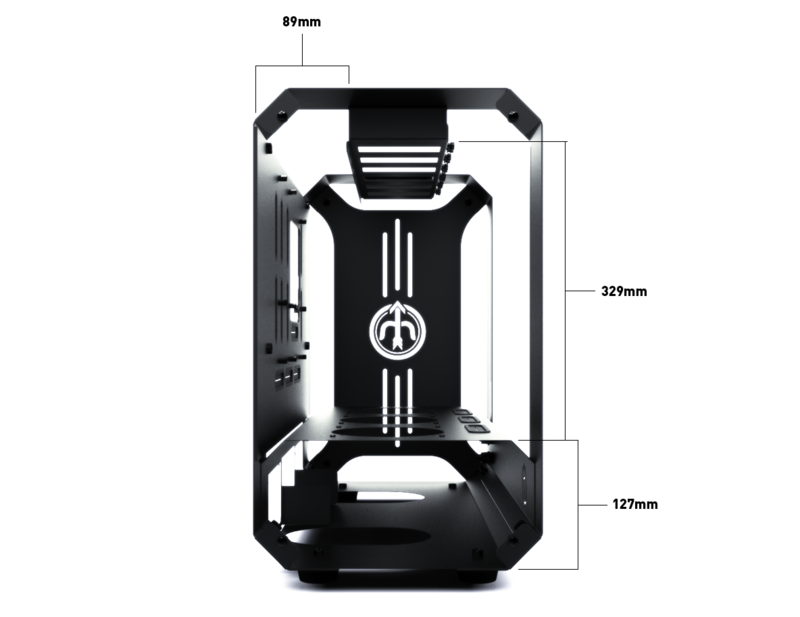 The chassis will support mini-ITX all the way through to E-ATX, have three 120/140mm fan mounts on the bottom, and has 685mm x 508mm x 305mm dimensions. 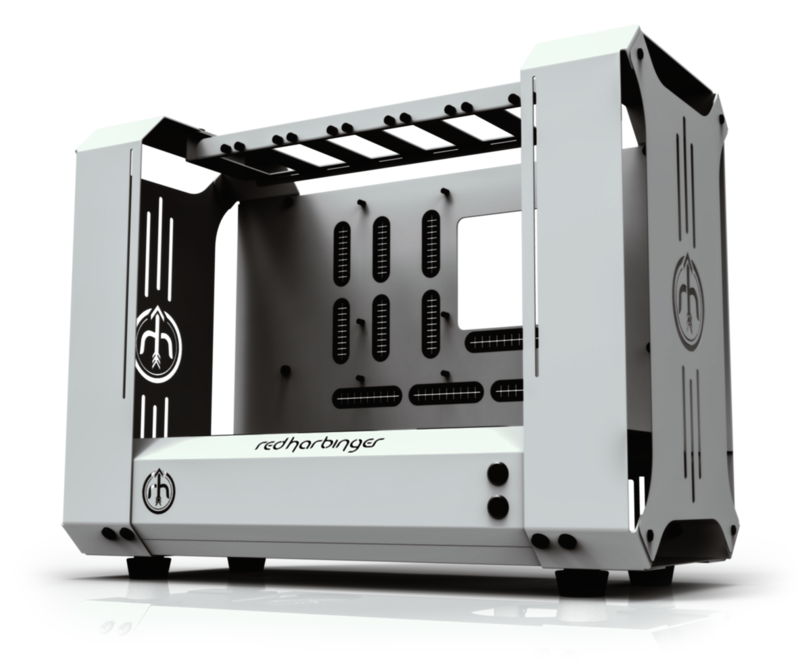 The chassis will come in black, with a limited edition run in white as well. 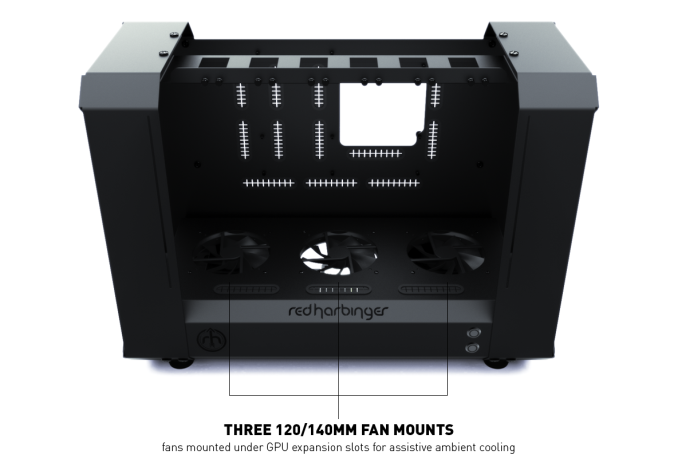 Red Harbinger are also promoting the chassis as a test bed / open-air chassis, which can be repurposed as a compute machine if the bottom falls out of scrypt mining. 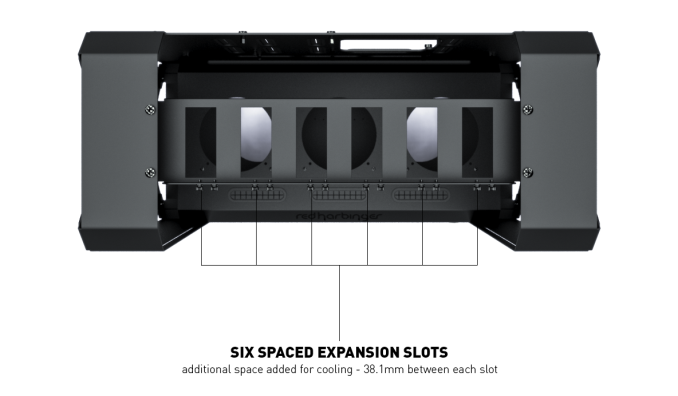 The early bird versions are currently $200 each, with the main run will cost $250 – this includes shipping within the US, add $50 for international shipping. In a field where saving a few dollars here or there makes a big difference, the DopaMINE is perhaps expensive as a case, but it does condense systems into easy-to-handle units. On a closer look it might seem that stacking the machines might be pointless if the heat from one set of miners is used to cool another set. 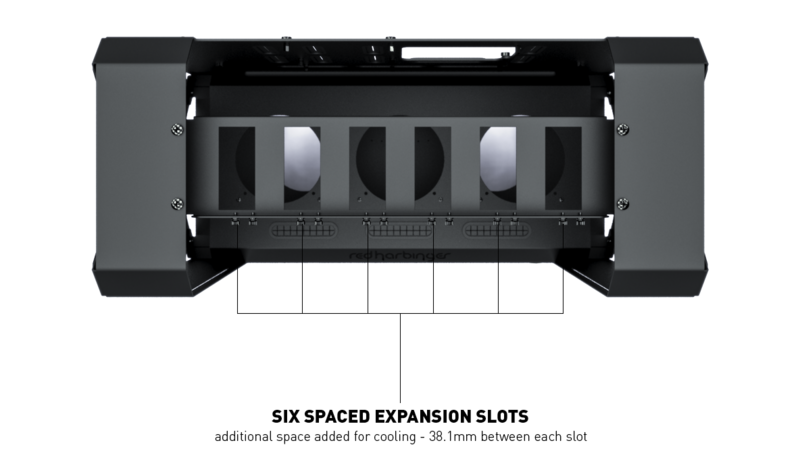 Ideally there needs to be some cross airflow left/right as well as bottom to top, and as I was discussing with Ryan earlier, blower GPUs might work best. As this is a crowd-funded project, there is no guarantee that the goal will be reached, but it will be an interesting marker for mining chassis from other companies. 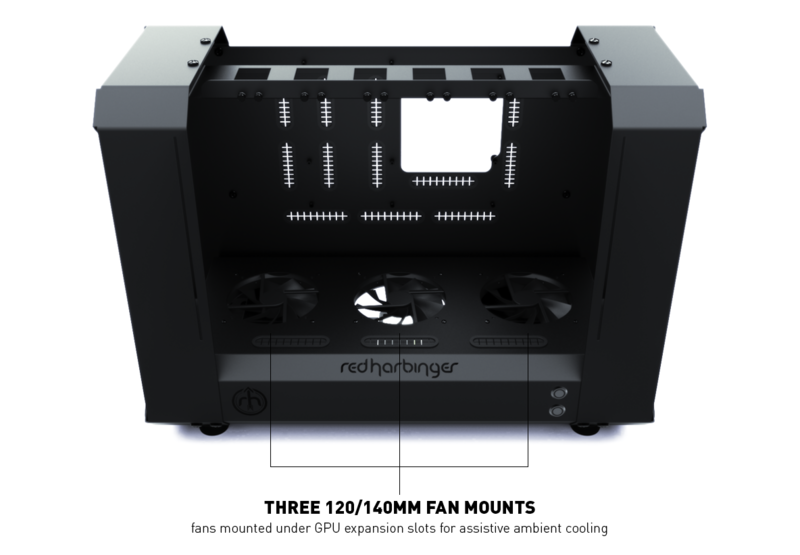 Red Harbinger is currently looking at an August estimated delivery date, with a $20,000 goal to be reached by April 4th. 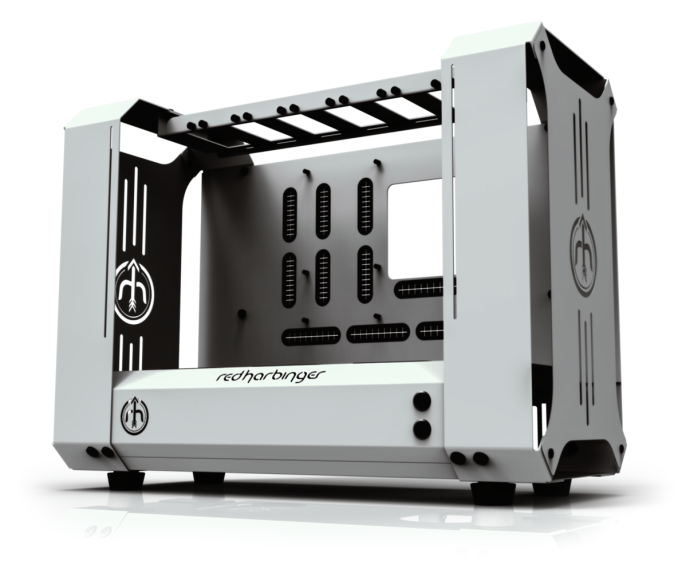 I have put an order in for a white one – at the very least I should be able to condense three of my chassis down to one, or I will put it to work for compute. And let's not forget quark, X11, and SHA3 (keccak) that are used as well. ASICs have taken over SHA256, and they're coming for vanilla scrypt, but scrypt-jane and adaptive-n may never really see ASIC support due to the RAM requirements, and SHA3 is new enough that we're at least six months (or more?) away from a working ASIC. If cryptocoin miners cared about profit, then they wouldn't be mining. It's an obscenely risky investment. Individuals are not smarter than the market. There's no beating the market in the long run. And yet, individuals still try to mine. We see this in the record prices for AMD GPUs. There's insane prices on GPUs and shortages still because it IS profitable, sometimes extremely so. Obviously the market is dictating that right now, else you would sell a mass exodus of cards for below MSRP in an attempt to recoup a loss. Pretty sure used 7950s were still going for nearly $400 just the other day. There isn't just money in Bitcoin, there's money in marscoin, peercoin, namecoin, doge, panda, sexcoin, florin, whatever the MARKET dictates that day/week.